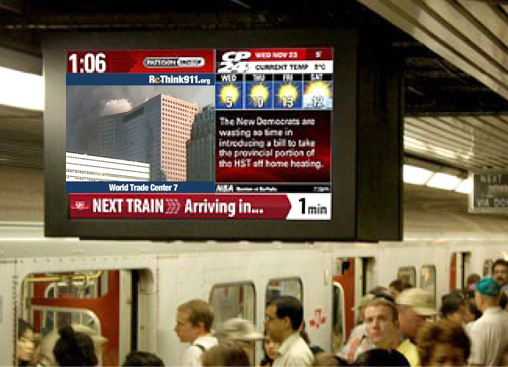 Today the ReThink911 campaign launched its newest wave of ads in the Toronto subway system. 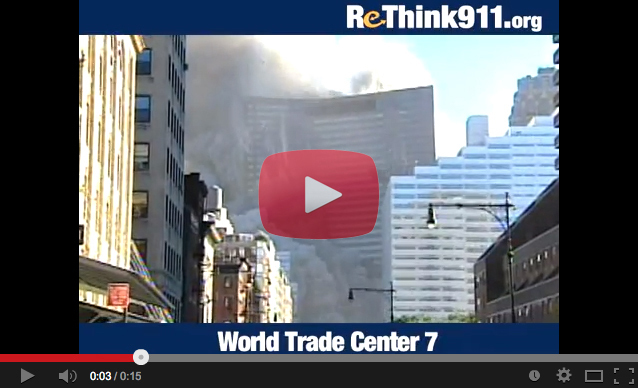 For the next two weeks, 1.2 million Toronto residents will see the video of Building 7’s collapse and be directed to ReThink911.org to learn more. According to Pattison Outdoor, daily subway riders will see the ad an average of five times during the two-week period. The ad blitz coincides with Richard Gage’s 3-week Canadian speaking tour, which brings him to Toronto on March 20 at Toronto University’s Innis Town Hall. To learn more and purchase tickets to an event in your city, visit ReThink911.ca. The decision to go digital and show riders the collapse of Building 7 was inspired by a scientific poll commissioned by the campaign last September, which found that 51% of Canadians who are shown video of Building 7’s collapse suspect it was a controlled demolition, compared to just 18% who suspect it was caused by fires. When asked who they are more inclined to believe—the U.S. government, which says fires brought it down, or the critics who contend it was controlled demolition—49% side with the critics, while only 20% are inclined to believe the government. 44% support opening a new investigation, with only 14% opposed. Stay tuned for updates on the ad campaign and speaking tour!